When you bring up “(Don’t Fear) The Reaper” by Blue Oyster Cult, it doesn’t take long before someone interjects “More Cowbell!” because of the Saturday Night Live sketch. I’ll get to that a little later but first I want to look at a different aspect of this song: the demography of “(Don’t Fear) The Reaper”. The lyrics of the song include an estimate of 40,000 deaths per day. So just how accurate is this estimate? The Census Bureau provides an estimated number of “vital events” (births and deaths) per day worldwide, and the current estimate is 156,676 deaths per day. They calculated this number by dividing the estimated population of the world, which is about 7.3 billion people, by the crude death rate, which is about 7.8 deaths per 1,000 population per year. But of course Blue Oyster Cult recorded “(Don’t Fear) The Reaper” in 1976. Using the UNdata, the estimated crude death rate worldwide was 10.6 per 1,000 population from 1975 to 1980, and the population of the world stood at 4,160,185,010 in 1976. Using these numbers there were about 44.1 million deaths that year, or about 120,486 deaths per day. So 40,000 deaths per day wasn’t a particularly reliable estimate, but to be fair, it was at least within an order of magnitude, not to mention that “40,000 men and women every day” flows more smoothly than “120,486 men and women every day”. By the way, just in case you think songwriter Buck Dharma might have been referring only to the United States, the estimated population of the United States in 1976 was 218,035,164 and the crude death rate for the United States was 8.6 per 1,000 population, which meant 1,875,102 deaths that year or about 5,137 deaths per day. Once again within an order of magnitude, but still way off. Still with me? OK, so… MORE COWBELL! Several years ago Wired published a “More Cowbell” timeline, which could use an update as interest in this meme has remained rather consistent (as measured by Google Trends) though perhaps slowly declining in recent years. 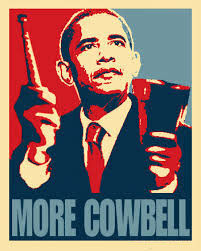 Still, you can get a wide variety of “More Cowbell” products. You can get a “More Cowbell” T-shirt, of course (with Gene Frenkle or The Bruce Dickinson), a “More Cowbell” Euro Decal Bumper Sticker or License Plate Frame, a “More Cowbell” necktie, or even a “More Cowbell” Cowbell. A book of career advice called The Cowbell Principle: Career Advice On How To Get Your Dream Job And Make More Money got a “thumbs up” from Blue Oyster Cult guitarist Buck Dharma. The phrase has an entry not only in the Urban Dictionary but also in the Cambridge Dictionaries Online, defined as, “an ​extra ​quality that will make something or someone ​better”. Mississippi State set a record for most people playing cowbells simultaneously (5,748), and the Tampa Bay Devil Rays have embraced the cowbell, encouraging their fans to, “Ring your cowbells when the following occurs: A Rays pitcher has two strikes against a batter. A Rays player reaches base or scores a run. Prompted by our RaysVision scoreboard.” Rules that are strictly enforced, apparently. The band members are fans of the cowbell sketch. Buck Dharma has made his own “(Don’t Fear) The Reaper” Behind the Music parody on his internet reality show, The Dharmas at Home. You can also download this and subsequent episodes from “The Funhouse” on Buck Dharma’s website. This is an updated version of a piece I wrote for the old Turn Me On, Dead Man blog in 2010. Posted on February 12, 2016 February 12, 2016 by Dead Man	in Serious Comedy. 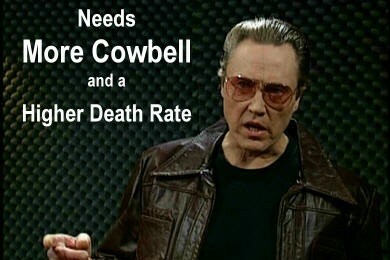 Tags: More Cowbell, Numbers. Posted on April 3, 2012 by Dead Man	in Serious Comedy. Tags: Bill HIcks, David Letterman.